Sometimes I can pull out my hair, I get so frustrated trying to get little children off to school on time. Keeping them on task is quite a battle. 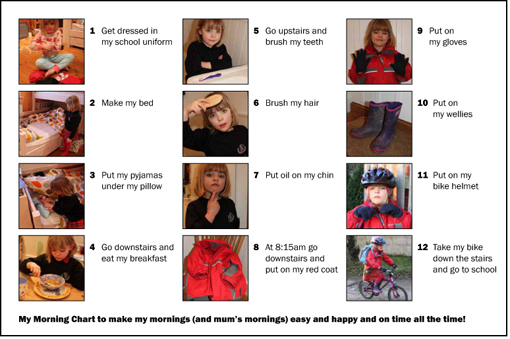 So I came up with the morning chart which photographically reminds Sophie step by step what she needs to do. It hasn’t solved all our problems but at least I can remind her to check her chart. And it has helped me to realise that there is quite a lot for a little person to do each morning.